I am very partial to slow roasting large joints of meat. I cook with an Aga and so, of course, slow cooking goes with the territory. Lamb, in particular, lends itself to slow cooking; the fat melts down deliciously, flavouring the tender, juicy meat so wonderfully. 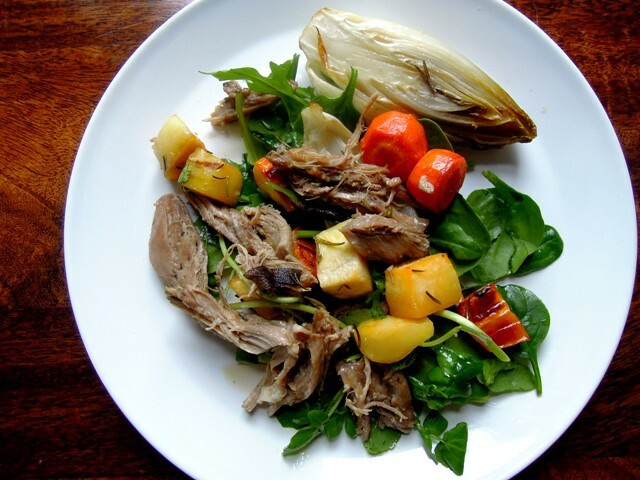 This warm salad was inspired by a recipe from Yotam Ottolenghi, which brings together shredded shoulder of lamb with roast chicory, raddiccio and figs. I have played with the ingredients a little to adapt the recipe to the contents of a winter vegetable box – sadly no fresh figs in there at this time of year. So instead, my version features roast parsnip, carrot and swede along with the chicory; all perfect partners for roast lamb with their caramelised sweetness. 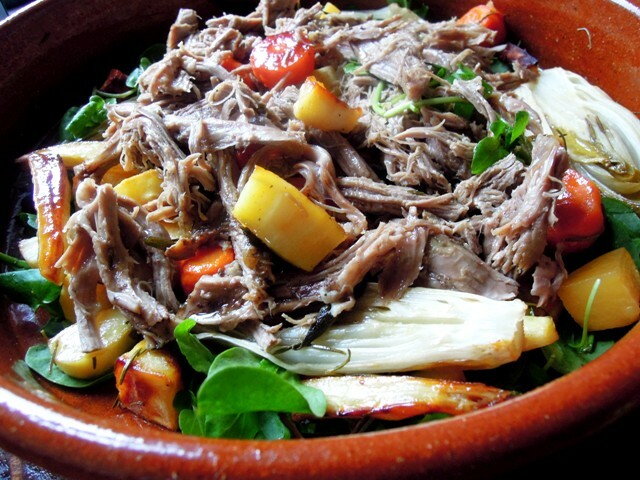 With plenty of fresh herbs in there and an incredible, slightly sweet and sour dressing with lemon, honey, cinnamon and pomegranate molasses, I think this warm lamb salad would be a wonderful dish to serve your family and friends this New Year. If you are using a conventional oven, preheat to 150ºC / gas mark 2. Place the lamb in a roasting tray and rub all over with a tablespoonful of the olive oil, lemon juice, mint, thyme, and a generous grind of salt and pepper. Pop the garlic halves next to the lamb, cut side down, and cover the tray with foil. If you’re cooking in an Aga, roast in the middle of the top oven for 20 minutes, before transferring to the simmering oven for 5 hours, regularly basting the meat with the cooking juices. Otherwise, roast in a conventional oven at 150ºC for 5 hours, again regularly basting the meat. When it is completely tender and the meat falls away from the bone easily, remove the lamb from the oven and allow to cool slightly. Shred into bite size pieces, discarding any fatty bits. Cover and keep warm. While the lamb is resting, prepare the vegetables. If necessary, increase your oven to 220ºC / gas mark 7. Place the parsnips, carrots and swede in a large bowl with 2 tablespoonfuls of olive oil, honey and a pinch of salt and mix well with your hands. Toss into a roasting tray together with the fresh rosemary and sage, and cook in the oven (top of the roasting oven in the Aga) for 20 minutes. Place the chicory halves in the bowl and add another spoonful of olive oil, a little more honey and a touch more salt, and mix together. 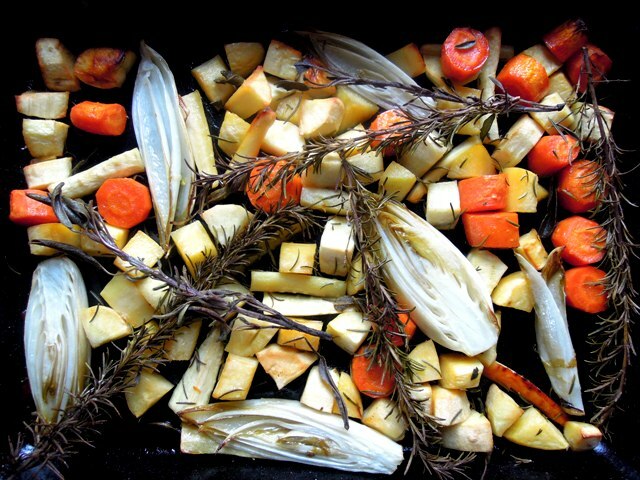 When the root vegetables have had 20 minutes, add the chicory to the roasting tray and cook for another 10 minutes, until the root veg is caramelised and the chicory is tender. To make the dressing, simply whisk all the ingredients together and set aside. To serve, place the rocket in a large, warmed serving dish. 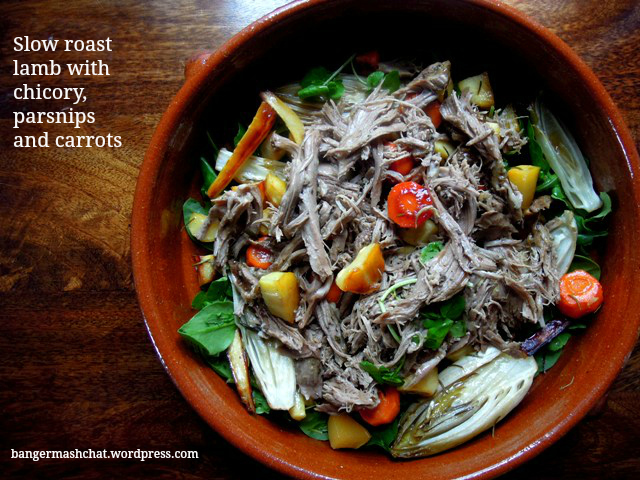 Scatter the roast vegetables over the top and finally cover with shredded lamb – you’ll only need about half of it. Save the rest for tomorrow. Drizzle the dressing over the top and serve immediately. As the dressing for this warm winter salad features a strong hint of cinnamon, I will enter it into this month’s Spice Trail challenge, which I just happen to host. Thanks Anneli. A salad might not seem obvious at this time of year, but it really does work with root veggies like this. My OH never used to eat lamb either – but slow roast lamb is one of his favourite dishes now. It took a little work, but I finally got him there! Maybe I should try it 😉 hope it tastes different than roasted lamb or those kebab type! Looks and sounds really delicious. Happy almost New Year – look forward to reading your blog in 2014. And I love Ottolenghi. Got all his books so I can just imagine how fab this tastes.